In an attempt to eat less meat at home, I broke out two of my vegetarian cookbooks and bookmarked recipes that sounded interesting. One of them was a pasta dish that involved ricotta cheese, which we happened to have in the fridge because it never made it into the flatbread lasagna. With all of the cheese, butter, and oil, this dish was soooo rich, in a carbonara/Alfredo sort of way, but I can imagine adapting it further to include less cheese and more veg. Mushrooms, broccoli, sliced Brussels sprouts, roasted bell peppers, and even corn would all work nicely. Put 4 quarts of water in a large pot and bring to a boil. In a bowl, toss cheeses with salt and pepper and half of the butter. Set aside. In a sauté pan, mix olive oil and remaining butter. Add nuts and stir to toast, then add garlic. 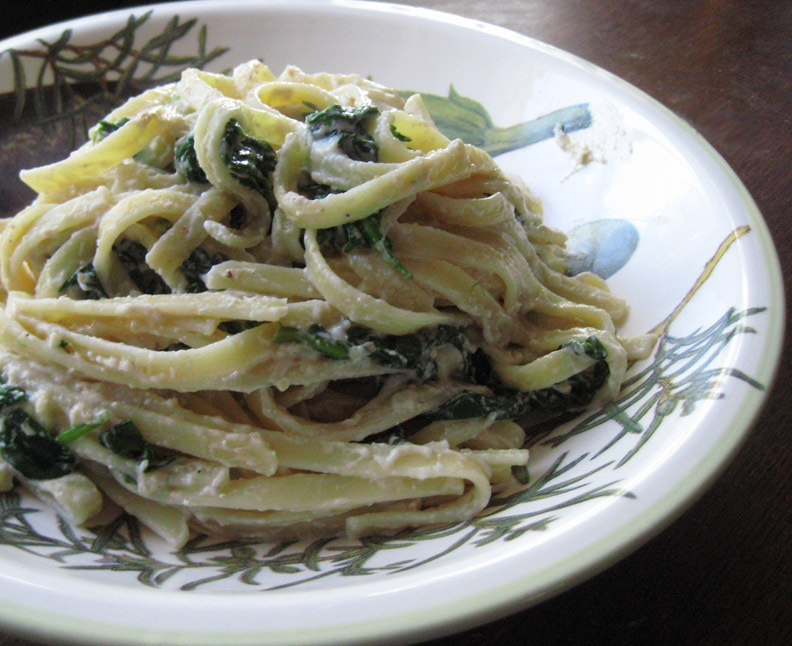 When it releases its aroma, add all of the spinach and cook until wilted. When water boils, add a generous pinch of salt (about 1 Tablespoon) and put in the pasta. Cook until just done and drain, reserving 2 Tablespoons of the cooking water. Return pasta to the pot and add the cheese mixture and the spinach mixture, tossing to combine. If the mixture seems a bit dry, add the reserved pasta water. Season with a bit of freshly ground nutmeg. yay for pasta eating on meatless monday. I made a cold noodle salad on Saturday and there were enough leftovers for tonight! but yummmmm rich pasta, it looks good Kathy.